1/3 Fewer Calories Than Sugar Pure and Natural Sweetener Excellent Alternative to Sugar There†™s a lot to like about xylitol. This naturally occurring sugar alcohol is one of the healthiest and most unique sweeteners you†™ll find. Unlike sugars such as sucrose and fructose, NOW Real Food® Xylitol is a sugar alcohol, which doesn†™t promote tooth decay. Even though it†™s classified as a carbohydrate, it has a low glycemic impact due to its slow absorption in the digestive tract, and its caloric impact is around 1/3 lower than other carbohydrates, making xylitol a healthy sweetener that's hard to beat. NOW Real Food® Xylitol Powder is derived from non-GMO corn and is the perfect healthy substitute for sugar in many cooking applications. Nutrition Facts Serving Size 2 Teaspoons (8 g) Servings Per Container: 57 Description Amount per Serving % Daily Value* * The % Daily Value (DV) tells you how much a nutrient in a serving of food contributes to a daily diet. 2,000 calories a day is used for general nutrition advice. Calories 20 Total Fat 0 g 0% Saturated Fat 0 g 0% Trans Fat 0 g Cholesterol 0 mg 0% Sodium 0 mg 0% Total Carbohydrate 8 g 3% Dietary Fiber 0 g 0% Total Sugars 0 g Includes 0 g Added Sugars 0% Xylitol 8 g Protein 0 g 0% Vitamin D 0 mcg 0% Calcium 0 mg 0% Iron 0 mg 0% Potassium 0 mg 0% Ingredients: Xylitol Powder (Non-GMO). Diarrhea may occur with excessive consumption. If this occurs, reduce intake or discontinue use. Xylitol is harmful to pets; seek veterinary care immediately if ingestion is suspected. Learn more about pet safety. 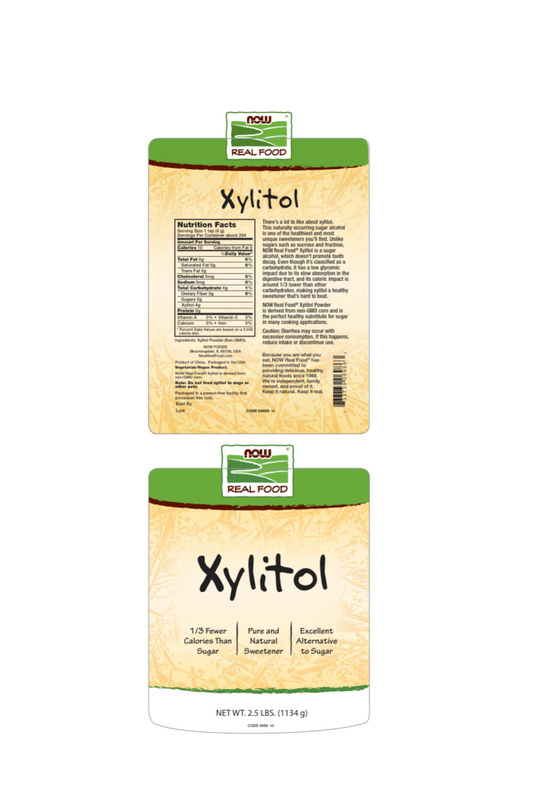 WARNING: Ingestion of Xylitol, in any product is a veterinary emergency if consumed by pets, especially dogs, ferrets and rabbits. If you suspect your pet ingested xylitol by either observing this happen or finding evidence of a chewed container or product, and the animal is acting normal, you should attempt to give animal(s) a small meal and at the same time, immediately seek veterinarian attention. If you have evidence that they ingested a product that contains xylitol and the animal(s) is not acting normal you should seek veterinarian attention immediately without giving the animal any food.